Every human activity has an environmental impact, and haircuts are no different. In fact, hair salons produce lots of hard-to-manage waste that is often contaminated with dye, bleach, and other chemicals. They also use a significant amount of water and energy. 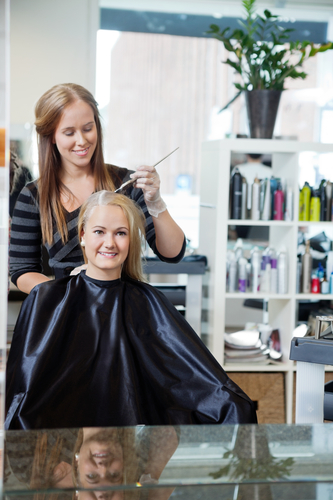 Fortunately, Green Circle is here to address these concerns and make salons more sustainable. What Is a Green Circle Hair Salon? Green Circle is making the beauty industry more environmentally friendly one hair salon at a time. Founded in 2009, this organization pioneers sustainable solutions for capturing, recycling, and repurposing salon waste. Namely, they instruct salons on how to separate materials – such as hair, plastic, paper, and metal – for collection. Green Circle then appropriately disposes of the waste or puts it to good use. Human hair, for example, is incredibly absorbent, so Green Circle uses discarded hair to create booms for oil spill cleanups. In addition to waste disposal, this prestigious organization is armed with a fleet of carbon offset vehicles to help salons balance their carbon emissions. Lastly, they coach members in making green changes in other areas of the hair salon. For instance, they encourage facilities to install LED lighting, utilize eco-friendly cleaning products, put in water-saving faucets. Together, these initiatives not only protect the environment but also reduce operating costs. Green Circle’s influence extends across over 1,500 hair salons in nearly every state and province in North America. That means there’s likely one in your city! Why Should You Visit One? By getting a haircut from a Green Circle hair salon, you’re not just giving your locks the pampering they deserve, but you’re also protecting the environment. Namely, you help the organization repurpose and recycle 95% of salon waste. You also allow Green Circle to donate five percent of their pre-tax profits to other groups – both at home and abroad – that create even more positive social and environmental change. For a high-quality Green Circle hair salon in New York, NY, look no further than Bloom Beauty Lounge. Located on W 19th Street, Bloom Beauty Lounge is proud to bring both style and sustainability to Manhattan’s Chelsea neighborhood. Call them at (212) 255-9355 to schedule an appointment. For more on their services including haircuts, color corrections, and blowouts, visit them online.